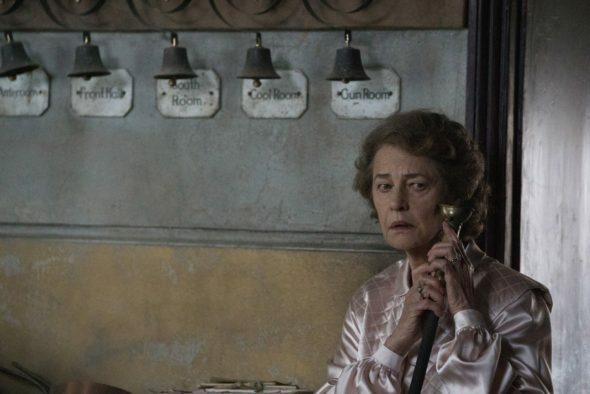 There were a lot of reasons to be excited about The Little Stranger. The film is director Lenny Abrahamson’s follow up to his staggeringly wonderful 2015 film Room. It stars three of the most solid character actors you will find (whether you know the names or not): Domhnall Gleeson, Ruth Wilson and Will Poulter. Who else? Oh, yes, Charlotte Rampling, who’s been a miracle of understated power since the mid-Sixties. On top of all that, it may (or may not) be a period British ghost story, and who doesn’t dig that? But something’s gone terribly wrong with The Little Stranger. It looks stunning. Abrahamson’s camera captures postcard quality images of spooky old mansion quarters, lonesome countrysides, sparse bachelor apartments. Gleeson’s performance is wonderful: restrained and proper to a degree that suits this particular character. Poulter (who is a marvelous and amazingly versatile actor) is underused, as is Rampling, although she cooly delivers enough decisive lines to make an impression. Wilson impresses most as Caroline Ayres, the put-upon sister in an old-money family that’s seen its share of heartache. She’s being courted, so to speak, by reserved country doctor Faraday (Gleeson), while she helps to care for her badly injured (inside and out) WWII veteran brother Roddy (Poulter), quietly helping him manage his responsibilities to the estate. Caroline longs to be free. Longing is maybe the most palpable theme in the film, along with the underlying nod to classism. Unfortunately, by Act 3, you’ll be longing for some action of any kind. Abrahamson’s film, adapted from Sarah Waters’s novel by screenwriter Lucinda Coxon (The Danish Girl), moves at an iceberg’s pace. Though the bumps, burns and bruises in the night are developed with the proper haunted house atmosphere, the resolution is so underdeveloped and slow in coming that the film cannot help but disappoint. The reveal makes sense to a degree, and bravo to Abrahamson for expecting audiences to have paid enough attention to earlier dialog that we might fathom the conclusion. At the same time, with too much thought, that reveal can fall apart. So, if you’re not paying attention you will have no idea what just happened. Pay too much attention and the mystery’s resolution will disintegrate on you. It’s unfortunate because there is an awful lot of talent and aesthetic going to waste here.